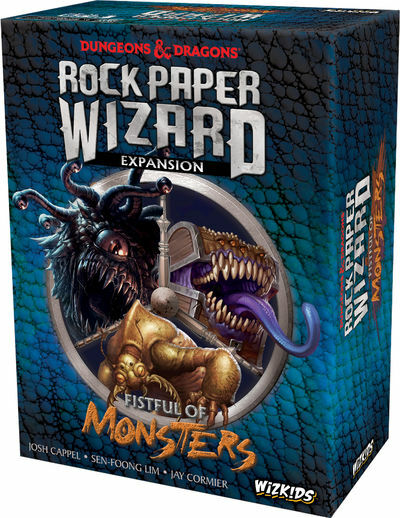 Rock Paper Wizard: Fistful of Monsters is the first expansion for the popular Dungeons & Dragons Rock Paper Wizard game brought to you by award-winning designers Jay Cormier, Josh Cappel, and Sen-Foong Lim. All the original game features you love are there, but now a new threat has entered the mix, the Wandering Monster. Encounter all your favorite classic D&D creatures, such as Mimics, Umber Hulks, and Beholders. Each Wandering Monster has their own unique ability, capable of forcing a wizard to move around the board, lose gold, or even take an Injury Token. However, Wizards are not totally defenseless. A stack of Magical Items, such as a Ring of Spell Storing and Wand of Fireballs, is located at the entrance to the cave. Use these in combination with spells to avoid the Wandering Monster and move into a scoring position while gaining the fewest Injury tokens. If you don`t, you`re going to have the pay the Cleric a sack of gold in order heal you! It`s going to take an ounce of cunning, a dash of guile, and a pinch of luck to dodge the Wandering Monster, outwit the other Wizards, and claim the gold from the dragon`s hoard! Be the first to collect 25 or more Gold to win the game!